What is Equine Kissing Spine? Kissing spine (Overriding/Impinging Dorsal Spinous Processes) occurs when the spinous processes of the vertebrae touch or rub together and is likely to cause pain and discomfort for your horse. Why does kissing spine happen? Each vertebrae in the horse’s back has 2 transverse processes and a dorsal process (one on each side pointing outwards=transverse, and one on top pointing upwards=dorsal). Each dorsal spinous process (DSP) is buried in the epaxial muscles which run down each side of the back on the left and right of midline, above each transverse process and to each side of the DSP. Each DSP is linked above by the supraspinous ligament which runs along the top of them all. In between each adjacent DSP is the interspinous ligament which gets compressed and stretched as they move. Symptoms similar to certain other conditions! There are 18 thoracic and 6 lumbar vertebrae. The most common sites for kissing spines are betweenT11 and T13, but they can occur anywhere between T10 and L6. Kissing spines therefore cause thoracolumbar pain. Manual palpation: This is subjective, but an experienced equine vet should have a good appreciation for what is ‘normal’ or abnormal. Palpation cannot diagnose kissing spines alone! It is important on the day of the vet visit that the horse has not already been exercised and hasn’t done any extremely strenuous exercise in the last couple of days. Radiography (x-rays): Vital part of diagnosis and with modern digital x-ray equipment we can get very good diagnostic x-rays of horse’s backs in practice. Radiographically we see reduction of the interspinous space, sometimes overlapping DSPs and often bone changes on the DSPs. But studies show that radiography alone is probably not enough on which to base a diagnosis, because some clinically normal horses will have radiographic changes. Scintigraphy (Bone Scan): Can be useful to diagnose kissing spines in combination with x-rays. 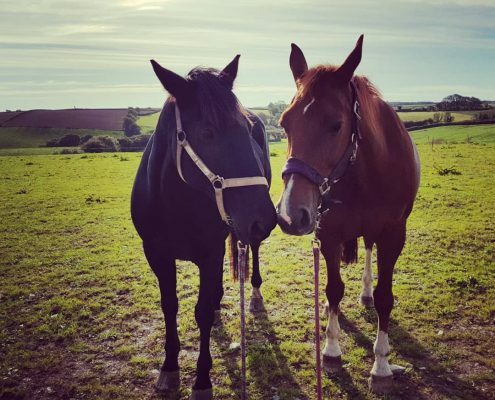 Physio: Secondary muscle pain is a big part of this condition and an equine physio can help reduce this and help build core strength to support the back. Medication: We can inject the offending spaces to reduce pain and inflammation. Surgery: Interspinous Ligament Desmotomy is minimally invasive and has good outcomes. DSP resection is possible in some cases. Possible treatments and management options would be discussed with the veterinary surgeon depending on individual circumstances.